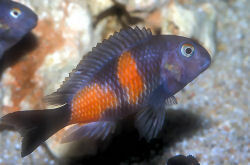 Tropheus "Bulu point" has a black body with two large red blotches on each side. Their aggressive conspecific behavior, their temperament along with their tendency to catch "bloat" and internal parasite makes it a real challenge, these cichlids should be kept only by experienced fish keepers. Like its entire genus the bulu point must be kept in large groups in the tank in order to disperse its natural aggressions. Feed plenty of algae based foods including flake and pellets. They are a algae, phyto-plankton and plant eater so must have a vegetable based diet. Like its entire genus the bulu point is a mouthbrooder. Males are a bit larger then females while females tend to be more rounded. The only way to be sure when sexing this species is by venting. The dominant male performs a "dance" around the female, as she will accept its court they will circle one another. After spawning, the male immediately fertilize the eggs, the female takes fertilized eggs into her mouth. She will incubate them in her mouth for about a month, after release the fry are free swimmers, large and ready to feed. 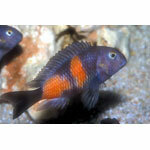 They can be fed with brine shrimp, fry foods or with crushed food. Not for the community tank. Best kept in a species tank with a group of 10+. Males can be very aggressive towards each other, and they are best kept with a one male to 4 or 5 females.